huhuhu.. aku geram dengan syark.. The C1 Ariete is the main battle tank of the Italian Army, developed by a consortium formed by Iveco-Fiat and Oto Melara (aka CIO, Consorzio Iveco Oto Melara). The chassis and engine were produced by Iveco, while the turret and fire-control system were produced by Oto Melara. The vehicle carries the latest optical and digital-imaging and fire-control systems, enabling it to fight day and night and to fire on the move. The first deliveries were in 1995, and the last occurred 8 years later in August 2002. The A5 introduced a wedge-shaped spaced add-on armour to the turret front and sides. Though its main function is to defeat a hollow charge attack, the spaced armour is also designed to affect kinetic-energy penetrators by forcing them to change direction and by eroding them in the process; it does not form a shot-trap since it doesn't deflect the penetrators outwards to hit the hull or turret ring. The gun mantle was redesigned to accept the new armour. There were also some improvements in the main armour composition. Tank interior received spall liners to reduce fragments if the armour is penetrated. Side skirts were replaced with a new type. The commander's sight was moved to a new position behind his hatch and it received an independent thermal channel. The gunner's sight was moved to the turret roof as opposed to the cavity in the front armour in previous models. A new heavier sliding driver's hatch was fitted. Turret controls went all-electric, increasing reliability and crew safety, and producing some weight savings. The gun braking system was improved to prepare the later mounting of the new L55 gun and to enable firing of more powerful ammunition, such as the DM-53 APFSDS. The A5 entered service in the German tank battalions in mid-1998. 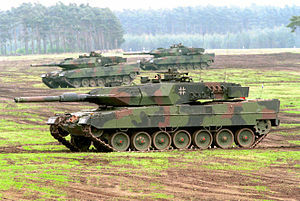 The Leopard 2(S) is a Swedish Army variant of the Leopard 2A5, which has received the local designation Strv 122. It is based on what was then called "Leopard 2 Improved" and features increased armour on the turret top and front hull, and improved command and control and fire control systems. Externally, the vehicle can be distinguished from the Leopard 2 A5 by the French GALIX smoke dispensers, different storage bins, and the much thicker crew hatches. It's also equipped with a new command system. The SA-6 GAINFUL is a two stage, solid-fuel, low-altitude SAM. It has radio command guidance with semi-active radar terminal homing. Development of the 3M9 antiaircraft missile for the Kub [Cube] system ended the career of Ivan Ivanovich Toporov, founder of the OKB-134 Special Engineering Office. The missile designed had not been experimentally verified, and it became necessary not only to build the missile but also to simultaneouly conduct basic research. During the initial test launch in 1961, the 3M9 missiles disintegrated in the air. The associated aerodynamic, engine, and guidance problems compelled Toporov to ask the Ministry of Armaments to extend the deadline for submitting the 3M9 to governmental tests. Toporov was removed from his post of chief engineer at the end of August 1961, becoming department chairman at the Moscow Institute of Aviation, and replaced by Andrey Lyapinov as director of the team. This did not accelerate the work on the 3M9. Finally in 1966 the missile together with all the Kub equipment was certified as an operational weapon, and it turned out to be one of the most successful Russian antiaircraft missiles. Although it is frequently reported that a naval version of the missile is the SA-N-3 GOBLET, this is evdiently not the case. The SA-6a missile has a length of 5.7 meters, body diameter of 0.335 meters, a wing span of 1.245 meters, a tail span of 1.524 meters and has a launch weight of 599 kilograms with a 56 kilogram HE-fragmentation warhead. The proximity and contact fuses are armed after some 50 meters of flight. The basic SA-6a has a maximum effective range of 24,000m and has a minimum effective range of 3,000m, the minimum engagement height is 100m when using the fire control (STRAIGHT FLUSH) radar and 80m when in the optical tracking mode, the maximum effective altitude is about 11,000m. A battery is able to relocate to an alternate firing position in approximately 15 minutes from systems being shutdown. In 1977, a new version - the SA-6b Gainful, was mounted on an SPU medium-tracked transporter. The SPU carried three SA-6b missiles and also an associated FIRE DOME H/I-band missile guidance illuminator radar is fitted on the front end of the launcher assembly. Reload missiles are carried on modified 6x6 trucks and are loaded manually onto the launcher by a crane carried on the rear of the loader vehicle. Reloading an TEL takes approximately 10 minutes. The STRAIGHT FLUSH fire control radar has a maximum range of 55 - 75km and a 10,000m altitude capability depending upon the conditions and target size, and performs limited search, low altitude detection and/or acquisition, pulse Doppler IFF interrogation, target tracking & illumination, missile radar command guidance and secondary radar missile tracking functions. Some modified fire control (STRAIGHT FLUSH) radars use a TV camera with a 30km range to enable the battery to remain in action even if the vehicle's radar is jammed or forced to shut down due to threats from anti-radiation missiles. This radar can also be linked to the launch vehicles by either a radio data link or a 10m long cable for direct data input to the launcher's systems. The data link antenna is carried on the right forward hull corner of the TEL. It also carries the fire control computers for the SA-6 Gainful missile battery. The foldable 28km range dish antenna is of the conical scanning type and is used for low altitude H-band sector search scans, target tracking and target illumination. The lower parabolic antenna is the G-band medium altitude target acquisition and early warning radar with a 55-75km range, with the lower feed for medium to high altitude coverage and the upper feed for low altitude coverage. The STRAIGHT FLUSH fire control radar can begin target acquisition at its maximum range of 75km, and begin tracking & illumination at 28km. The STRAIGHT FLUSH radar can only illuminate a single target and control three missiles at any one time so normal practice when a target track has been initiated is to normally order the launch of two and sometimes three weapons from one or more TELs. Hope what ever u spend is really worth it. takpe bro, bila collector mintak kita buat lagi maknanya dia really appreciate the work of the modeller. Syark Memang terhebat la.. mne ada aku koleksi.. aku hanya ada 2 benda jer..